Early LCP (bottom, with Crimson Trace laser), compared to the new version (top). The diminutive size of the LCP is readily apparent compared to a Smith & Wesson Model 342PD five-shot .38 Special revolver. 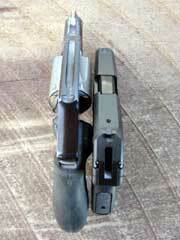 Newer LCP has a blued steel barrel, while the early pistol's barrel is brushed stainless. 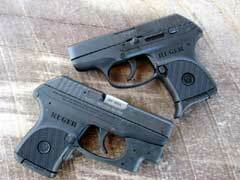 Ruger’s dandy little LCP .380 pocket pistol has become the hottest selling new pistol for 2008. 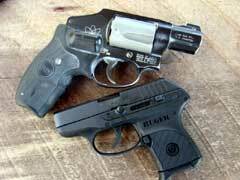 After the introduction of the LCP on February 2nd of this year, Ruger has sold several thousand of the little pistols. They are still hard to get, with my local gun dealer informing me that he can sell a lot more of the pistols than he can buy. 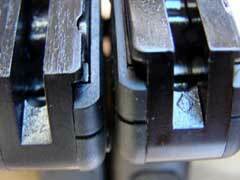 Ruger is producing, but demand still exceeds supply. However, he does get one in occasionally, but it never stays on the shelf for long. By any standard of measurement, the LCP is an enormous success. After the introduction at the 2008 SHOT Show in Las Vegas, I immediately began pestering the good folks at Ruger for a test gun, which arrived within a couple of weeks. 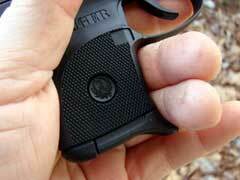 The LCP proved to be a reliable, lightweight, compact, and easy-to-use pocket pistol, and has served me well. For more details on that little pistol, I refer you to my earlier review. A little over a month ago, Ruger learned that it was a possibility with some of the early pistols that, if dropped, they might accidentally fire. I know of no reports that an LCP ever did actually unintentionally discharge, but Ruger immediately issued a recall of every LCP that had a serial number with the prefix “370”. 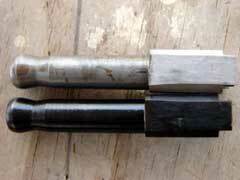 Ruger began the retrofit of a new hammer assembly a couple of weeks later, to correct the potential problem. Ruger pays the shipping both ways, and they are also giving the owner of a recalled pistol a new magazine for his trouble. The new magazine also has a finger-rest floorplate, which is a nice feature, and makes the LCP much easier to hang onto while firing. I recently received an LCP that has been through the recall process. Included was the free magazine, and other than the finger rest, there is nothing obvious externally different between this pistol and my earlier pistol. There are 63,157 serial numbers between my older gun than this later one, so Ruger has really been cranking out the LCPs during the past several months! To distinguish that a pistol has been back to the factory for the recall, Ruger stamps a small diamond on the frame, at the bottom of the hammer relief channel. It can be easily seen in the picture comparing it to the pistol that has not been back for the recall. Again, if your LCP has a serial number beginning with anything other than “370”, it already has the upgraded hammer assembly, and is not affected by the recall. Also, if you find an LCP for sale that has the diamond stamped at the bottom of the hammer channel in the frame, it has already been retrofitted and updated. I was curious about whether or not the pistols could discharge if dropped. To prove it to myself, I intentionally dropped both my older pistol and the updated one on the hard wood floor of my shooting shack porch. Not wanting a .380 bullet to be flying around uncontrolled ( I have been hit by one before), I loaded the pistols with an empty, primed cartridge case. That way, if it did fire, I would hear the report of the primer firing, but no errant bullets would be involved. The earlier pistol that has not been sent in for the recall would not fire, but the firing pin did leave a very slight mark on the primer of the empty cartridge case. The pistol that has been upgraded left no mark at all, so it was obvious that the new hammer assembly is doing its job. The trigger pull on the updated gun is still very smooth, like the earlier LCP, but has a slightly heavier trigger pull weight. It still is a very good pull, measuring five pounds, ten ounces, and again, is very smooth to operate. That is only four ounces heavier than my other LCP measured when new, so the trigger pull was really not adversely affected at all, as I had anticipated that it might be. The trigger on the LCP does not pinch my finger like I experience with some small auto pistols, and is very comfortable to shoot. If you have an LCP that is affected by the recall, there is no need to be apprehensive about sending your gun in. Ruger is striving hard to get the guns back to their owners in about one week, and again, there is no cost at all to the LCP owner, and the free magazine will be included in the package with the updated pistol. Do not send in your LCP to Ruger until they tell you to do so. They will send you instructions, a shipping package, and shipping label. 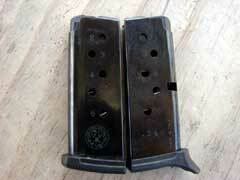 With every upgraded LCP, Ruger includes a free magazine with finger rest. 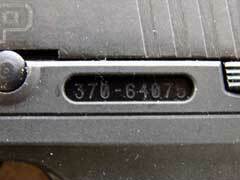 All pistols affected by the recall have a serial number beginning with the prefix "370". Ruger stamps a diamond in the frame's hammer channel on all upgraded pistols, making it easy to tell if a pistol has been retrofitted.